President Trump Displays Commanding Leadership at U.N.
On the world stage, Trump is Muhammad Ali to Obama’s Mister Rogers. Donald J. Trump’s week at the United Nations should squelch renewed chatter about his alleged mental instability and unfitness for office, and why the 25th Amendment should be used to slip him into a straitjacket and speed him to the nearest asylum. From Sunday to Thursday, a commanding President Trump practiced high-level diplomacy in New York. He signed the U.S.–Korea Free Trade Agreement, hosted a reception for Security Council members, and conducted one-on-one talks with U.N. Secretary General António Guterres and the leaders of Colombia, Egypt, France, Israel, Japan, South Korea, and the United Kingdom. Wielding a gavel, President Trump chaired the 8,362nd meeting of the U.N. Security Council, specifically on limiting weapons of mass death. He also fielded wide-ranging questions at a one-hour, 22-minute news conference. But President Trump’s main event was his 35-minute address to the General Assembly. 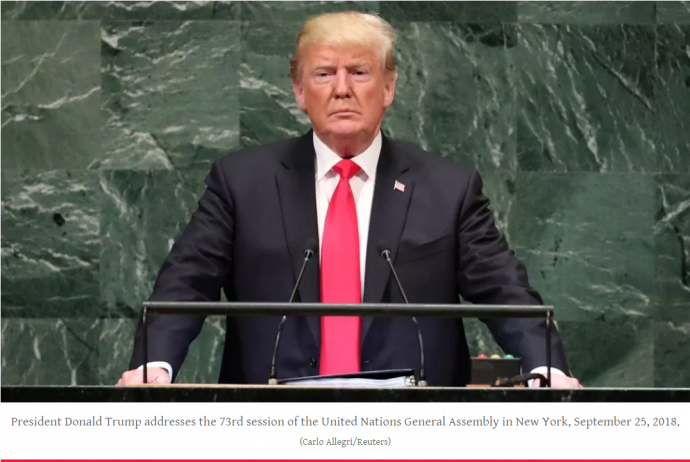 Standing at the U.N.’s signature green-marble rostrum on Tuesday morning, Trump advocated “principled realism.” He reasserted Washington’s vision of individual, sovereign nations bilaterally collaborating with America. This deepens the president’s break with Obama’s policy, which was to surrender ever more American influence to the U.N., the Paris global-warming treaty, and other multilateral bodies and agreements.